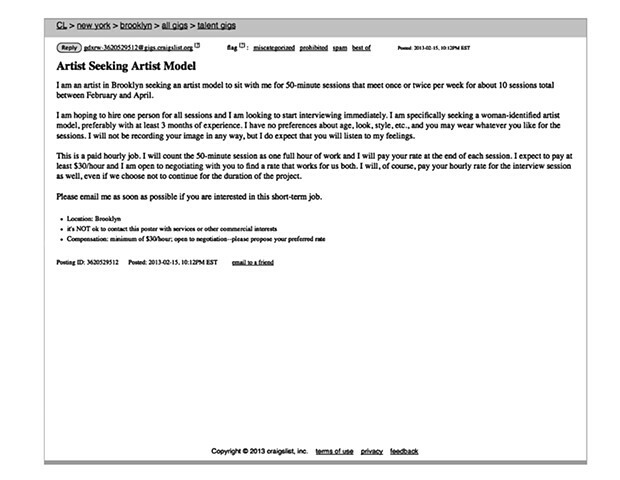 [Image Description: Black and white desktop screenshot of craigslist ad titled “Artist Seeking Artist Model.” No image. The text reads as, “I am an artist in Brooklyn seeking an artist model to sit with me for 50-minute sessions that meet once or twice per week for about 10 sessions total between February and April. I am hoping to hire one person for all sessions and I am looking to start interviewing immediately. I am specifically seeking a woman-identified artist model, preferably with at least 3 months of experience. I have no preference about age, look, style, etc., and you may wear whatever you like for the sessions. I will not be recording your image in any way, but I do expect that you will listen to my feelings. This is a paid hourly job. I will count the 50 minute sessions as one full hour of work and I will pay your rate at the end of each session. I expect to pay at least $30/hour and I am open to negotiating with you to find a rate that works for us both. I will, of course, pay your hourly rate for the interview session as well, even if we chose not to continue for the duration of the project. Please email me as soon as possible if you are interested in this short-term job.